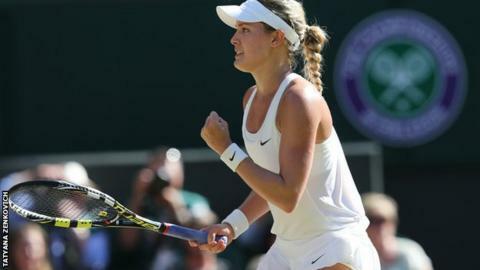 Eugenie Bouchard beat Romania's Simona Halep to become Canada's first Grand Slam singles finalist at Wimbledon. The 20-year-old from Montreal won 7-6 (7-5) 6-2, and will face 2011 champion Petra Kvitova in Saturday's final. Bouchard, seeded 13th, won the junior title in 2012 and reached the semi-finals at the first two Grand Slams of the year in Australia and France. "I am really excited," Bouchard told BBC Sport. "It is my first Grand Slam final and I will just go for it." In the other semi-final, Kvitova faced her Czech compatriot Lucie Safarova, winning 7-6 (8-6) 6-1. Third seed Halep, who had suffered a thigh injury earlier in the tournament, turned her ankle in the fourth game and required heavy strapping in a medical timeout. "It was difficult to continue. I felt a big pain in the moment, but then was better with the tape," she said afterwards. "But still I couldn't push anymore in my leg. My first serve was really bad after that. Yeah, it was difficult to continue with another injury." On a hot afternoon on Centre Court, the 22-year-old pushed hard in the first set but let a 4-2 lead slip in the tie-break and could not recover. The result means Bouchard will move into the world's top 10 after Wimbledon, and there could be more good news for Canadian tennis on Friday, when Milos Raonic plays Roger Federer in the men's semi-finals. Bouchard added: "I would never say I was surprised because I have put in a lot of hard work in and it has been a long time in the making. I am always wanting to better myself and I am focused." Bouchard and Halep arrived in Thursday's semi-final as the form players in Grand Slams in 2014 with 15 wins apiece, and their only previous meeting resulted in a tight three-set win for Halep in Indian Wells earlier this year. Another close contest was expected but the match took a decisive turn after just 15 minutes, when Halep went over on her ankle as she moved out wide when facing break point in game four. The Romanian hobbled back to the chair to receive treatment, and from then on was always struggling to keep pace with the relentless Bouchard. Bouchard missed two break points in game seven and trailed in the tie-break, which was interrupted for five minutes as a spectator received medical attention in the crowd. At 4-2 down, Bouchard got a huge stroke of luck with a net cord and she took full advantage, swinging away a drive volley on set point to clinch the set after an hour's play. "When you don't see a massive celebration it means the job is not done yet and she will be back on Saturday to complete the job." With her movement surely restricted, Halep struggled to mount a sustained challenge in the second set, falling behind with two double faults in game three. A French Open finalist last month, the Romanian fought gamely to see off three match points at 5-1 down and keep her hopes alive, with Bouchard disturbed at one point by a call from the crowd. Bouchard betrayed some nerves when she let two more match points slip in the next game, but she finally clinched victory with a serve out wide. "It was a little crazy at the end," the Canadian added. "I have never ended the match like that but I was just happy I kept my focus and completed it in the end. It took mental strength to stay focused but it is important to enjoy it out there and focus on the point." Kvitova, the 2011 champion, had earlier beaten fellow Czech Lucie Safarova 7-5 (8-6) 6-1 in the first semi-final.